​and Schubert's Magnificat, as well as concerts with Wilmington Concert Opera and Philly Senior Stage. Maja Lisa has sung Hansel in Hansel and Gretel with Opera Lancaster and Bersi in Andrea Chenier with ConcertOPERA Philadelphia, the Announcer in Gallantry , Suzuki in Madama Butterfly with Delaware Valley Opera Company, Orlpfsky in Die Fledermaus with Center Stage Opera, Meg in Falstaff , Hansel in Hansel and Gretel with Delaware Valley Opera, Dinah in Trouble in Tahiti with Poor Richard’s Opera Company and Mercedes inCarmen with ConcertOpera Philadelphia. She made her New York City debut with Opera Manhattan singing La Sorella Infermeria in Suor Angelica . She sang the role of Mother in Amahl and the Night Visitors with the University of Iowa. She sang Nursing sister in Suor Angelica with ConcertOpera Philadelphia and Praskovia in Merry Widow with Delaware Valley Opera. She has covered the roles of Carmen in Carmen , Maddelena in Rigoletto , and Charlotte in Werther . As a Young Artist with The Cedar Rapids Opera Company she sang the role of Wife of the Giant in Jack and the Beanstalk. 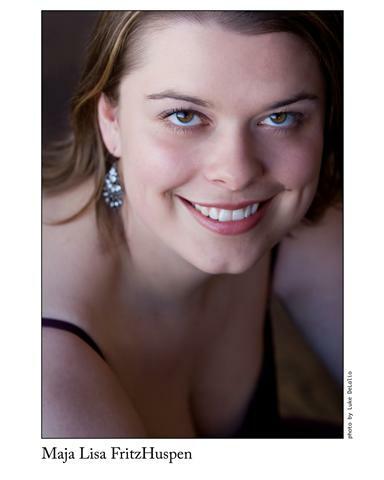 She was also a Young Artist with Center City Opera Theatre during the 2008-2009 season. Maja Lisa began her operatic career as a soprano, singing the roles of Lauretta in Gianni Schicchiwith Delaware Valley Company, Mrs. Jenks in The Tenderland , and La Ciesca in Gianni Schicchi . She also covered Mimi in La Boheme at the University of Iowa. Maja Lisa is an active soloist having performed the Messiah with The Bismarck Civic Chorus and First United Methodist Church of Germantown. She was a featured soloist with the Bismarck Symphony Orchestra for an evening of Verdi Arias and for their annual July 4th Capital Gala. She has been the Alto soloist in Mozart’s Sparrow Mass in C Minor Missa Brevis and Mozart Coronation Mass with the Fairmount Chamber Orchestra. With Independence Sinfonia she was the Alto soloist in Beethoven’s 9th Symphony and with Vox Fidelis she was the alto soloist for the Mozart Requiem. Her recital performances have included Concert Arias by Mozart, Margaret Songs, Libby Larsen, 6 Romance, and Verdi. Maja Lisa presented a multi-media recital of William Blake’s poems and paintings from Song of Innocence and Experience, with music by Vaughn Williams. She has been featured on the Schubert Club courtroom recital series in St. Paul. As a chorister and vocal performer, Maja Lisa has sung in Russia, Finland, Estonia, and Paris. She has performed Brahm’s Requiem, Puccini’s Mass in C, Durflé’s Requiem and Mendelssohn’s Elijah. She toured the West Coast with the Augsburg College Orchestra as their featured soloist. A native of Bismarck, ND, Maja Lisa received her Master’s degree in Vocal Performance and Master of Fine Arts from the University of Iowa (Iowa City, IA) and her Bachelor’s degree in Vocal Performance from Augsburg College (Minneapolis, MN. She was awarded first place in The Schubert Club Intermediate Category competition. She is a voice student of Richard Johnson and coaches with Laurie Rogers and Lisa Harer de Calvo. Ms. FritzHuspen is a member of the Learning Arts, where she gives concerts and master classes in the Adirondack region of NY.